COPPERCHARGE PLUS is a mineral trace element combination for spraying onto pasture (or crop) that will be grazed or made into silage/ baleage. It can be applied in the early spring for stags. Results from our trials are in line with industry trials and demonstrate that spray application of copper is a viable alternative to copper bullet treatment. CUVENAMIN is a trace element mix designed to be added to supplementary feed for a 30-90 day set up period. It can be added to silage (powder spread over load), gravity sprayed onto baleage as it is unrolled (20litre container, hose, plastic tap and watering can nozzles). It can also be added to the water supply (via trough dispenser / header tank), though there is potential for the water to become unpalatable if the stags are not drinking enough and product continues to be added. 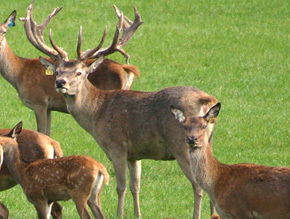 After the roar stags are very responsive to feed palatability. The change in behaviour of stags on treated crops post roar is often quite astonishing – stags that stop fighting and instead want to eat. The resultant shift in body condition and health coming out of the winter has a considerable influence on velvet yield. SCOFFERT is added to fertiliser and lime at crop establishment and completes the profile of fertiliser nutrients in order to maximise yield (yield response expected in inland areas), improve drymatter quality, increase palatability and with it the proportion of crop utilised by choice.